Death is no barrier to Chinese ancestors receiving the latest gadgets, with paper iPads, laptops and LCD TVs burned at gravesides across Asia to mark the Ching Ming festival this week. Paper money, clothes, luxury cars and handbags have long been standard items for the Chinese festival, also known as grave-sweeping day, when replica offerings are burnt for the dead to use in the afterlife. 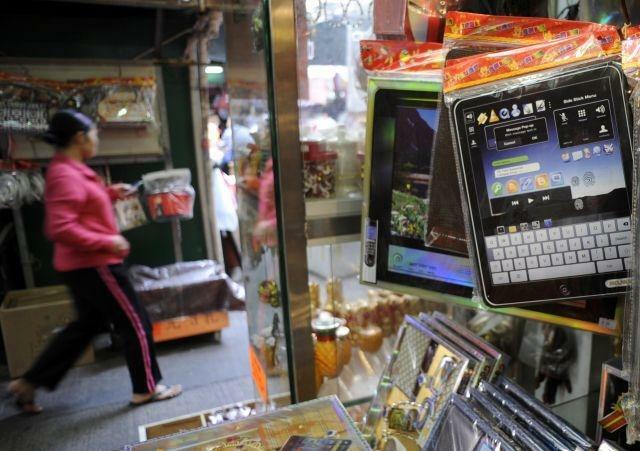 The latest tech hardware joined the list of items which went up in smoke this year, with many shops selling the paper offerings saying they could not meet demand for replica iPads. "These are the bestsellers this year," said Chan, a shop owner in Hong Kong's busy Causeway Bay district, pointing at the black iPads that go for HK$25 ($3.2) each. "They are the latest technology. Old and young customers love them because they are the newest models," said Chan, whose shop sells a range of paper offerings, including 42-inch LCD TVs for HK$60. Another shop owner said high-tech items including iPads, iPhones, laptops and LCD TVs were sold out despite placing additional orders for the paper products. "People have been buying like crazy, it's all sold-out," said the shop owner who gave her name as Yuen. Demand was also strong in China and Taiwan for similar items. "My father was a college professor. He was open-minded and accepted new things easily," Wuhan resident Hu Yuqin, who spent 876 yuan ($135) on a paper iPad and iPhone 4, told Chinese state media. "I think the Apple products would make him happy," said Hu. "By burning the offerings, the family want to compensate what they have not done for their beloved ones in the human world," Yean Han, director of Taiwanese shop, Spectacular Kind of Elysium Accessories, told AFP. The company, based in northern New Taipei City, sells offerings from the mundane, such as paper cosmetics and sushi bars, to the bizarre -- a Japanese-style hot spring resort which carries a price tag of Tw$168,000 ($5,695). Aside from paper gadgets, people can also buy replicas of pet food and chew toys for their dead pets, according to Hong Kong's South China Morning Post. In Singapore, 47-year-old Steven Foo ordered a paper private jet and other goods for his late mother. "My mother loved travelling so I got her a private Boeing jet to travel around the world," Foo told AFP. "I also got her a big bungalow, nice clothing, nice shoes, nice bags, nice sunglasses. When she was alive, she loved to travel and big houses." In multiracial Malaysia, where a quarter of its 28 million are ethnic Chinese, the festival was also observed with paper offerings including iPads, diamond rings, credit cards and Mercedes-Benz cars complete with drivers. "The Chinese believe this Confucian rite will make our dead ancestors guard us against evil forces and keep bad luck away," said George Choo, who visited the graves of his parents just outside the capital Kuala Lumpur. He was however sceptical about offering high-tech items. "iPad is a modern gadget that came after they died. I just wonder who is going to teach them how to use it," said Choo. Singaporean Robert Han said his family opted to stick to the traditional offerings of clothes and money for his late father. "For us, we stuck to tradition and gave the traditional things like money, lots of money for them to use (in the afterworld)," he told AFP.